Alaska’s summer tourism season has produced the strongest months on record for wholesale marijuana sales, but MJ businesses are still adapting to the cyclical nature of the state’s adult-use market. The state’s cultivators sold nearly 2,500 pounds of flower and trim to retailers and infused product manufacturers in July – an increase of 7% from the previous month and up 154% from July 2017. Wholesale cannabis sales have risen every month since March as retailers stocked up on product ahead of the busy tourist season, which typically runs from Memorial Day through Labor Day. Cary Carrigan, executive director of the Alaska Marijuana Industry Association, said the market surges in the summer, with the majority of the state’s adult-use retail sales taking place over this three-month period. 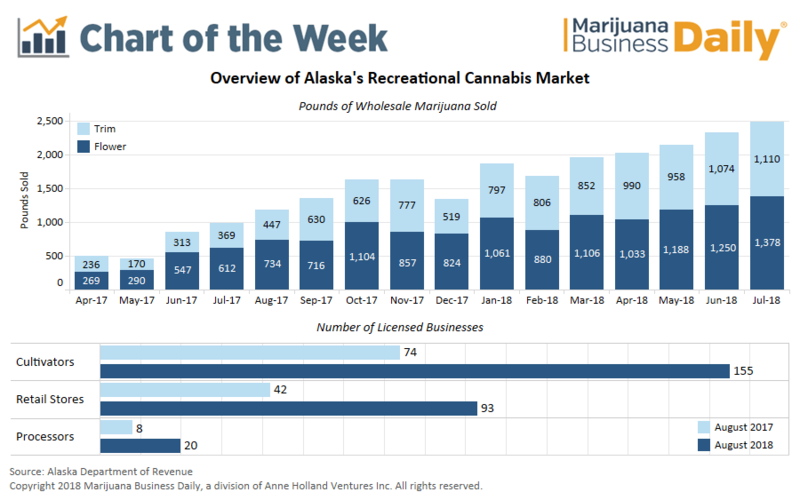 The number of cannabis businesses in Alaska also has increased sharply compared to a year ago, with the number of licensed cultivators and retailers in the state rising 109% and 121%, respectively. But Carrigan doesn’t believe Alaska has reached a saturation point in terms of the number of licensed businesses because not all companies have been able to successfully navigate the state’s unique industry. “It’s taken cultivators and retailers some time to get to the point where they’re operating in a place where they understand they have to slow it down and pull it back a little bit in the fall and winter, then ramp it back up in the spring,” he said. Retail sales of adult-use cannabis in Alaska are still somewhat of an unknown. Unlike Colorado or Washington state, Alaska doesn’t levy taxes on marijuana at the point of sale, which can be used to calculate consumer spending on retail products. All tax revenue the state collects from its recreational marijuana program comes from cultivators, which pay a flat tax of $800 per pound of flower and $240 per pound of trim when it’s sold or transferred to retailers or infused product manufacturers. The 2018 Marijuana Business Factbook estimates that retail sales in Alaska will reach $70 million-$100 million in 2018. Wholesale cannabis prices in Alaska are some of the highest in the nation, but prices have fallen as more production capacity comes online. According to several business owners in the state, prices for a pound of wholesale marijuana hovered between $2,800 and $5,000 earlier this year. By comparison, the volume-weighted average price per pound of marijuana across the United States is $1,108, according to wholesale pricing data provider Cannabis Benchmarks. One of the few mj publications that provides extensive research and analysis. I would not take this quote on its face value.